As at the end of June, there are over 4 million electric cars sold worldwide with another million expected to be added by end of the year. This significant growth shows just how popular and promising the market is for electric cars. Keep reading to learn about the distinct types of electric cars currently disrupting the auto industry, and how the market presents a unique opportunity to consumers, businesses and investors. What distinguishes electric cars from regular cars? 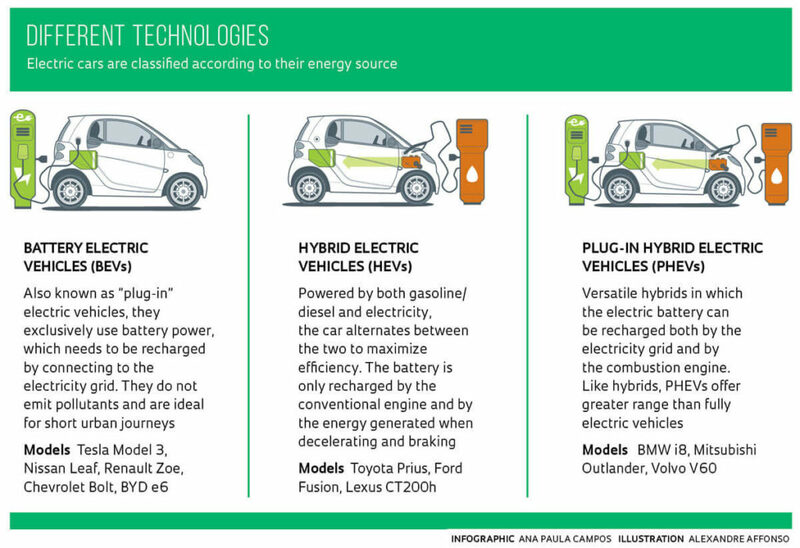 The term “electric vehicle” (EV) actually encompasses three kinds of electric cars. Each type of vehicle has its advantages and disadvantages regarding range, emissions and affordability. BEVs are entirely powered by electricity; there is no fuel in these cars. They need to be charged via external sources of electricity or by a process known as regenerative braking (in which the car’s motor slows down the vehicle to recover energy). HEVs are a hybrid of electric and standard vehicles. They contain a fuel tank and a classic engine along with an electric battery and motor. However, their main energy source is not electric; it’s standard fuel. These cars can vary in how “electrified” they are, some models making use of their battery more than others. PHEVs are similar to HEVs, the difference being that they are mostly powered by electricity instead of classic fuel. The vehicle’s combustion engine is used when electric power is running low, also providing the car with a longer range than BEVs. Despite experiencing exponential growth in recent years, the EV industry is still in its early stages. With fuel prices soaring and many countries pledging to ban gas cars in the near future, the push for electric vehicles is propelling this industry and its technology forward. Experts predict that these cars will be as affordable as traditional cars within 7 years, and that battery manufacturing could triple in the next four years. The implications of the electric vehicle market extend far beyond the manufacturing of the cars themselves. Businesses and investors can engage with this growing industry in a number of ways. Businesses should consider investing in charging stations at their locations. This commitment to sustainability would attract customers, as well as provide direct revenue if clients pay to charge their vehicles. Investors could also consider companies looking to further innovation in EV technologies, these encompassing automotive, energy and tech companies alike. The very thought of electric vehicles used to exist primarily in science fiction. Today they’re a reality, and will soon become commonplace, given their increasing affordability. With a clearer understanding of how EVs work and how their technology is reshaping the auto market, consumers can better decide whether an EV might be the right car for them, and investors can get a better idea of why they should be engaging with this growing sector. The Evolve Automobile Innovation ETF (CARS) provides investors with exposure to some of the top players in the electric vehicle market, this including manufacturers of cars and batteries, as well as energy companies.